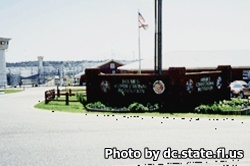 Holmes Correctional Institution is located in Bonifay Florida. It is a level IV facility that currently can incarcerated 1,185 adult male offenders. Custody levels that are housed here are minimum, medium and closed custody inmates. The educational programs offered at this institution include adult basic education, GED courses, and special education opportunities. Inmates can also learn vocational skills including welding, computer repair, and automotive collision repair and repainting. Offenders can also take part in a variety of self improvement programs offered through the Chaplains office. These include yoga, religious studies and worshiping, parenting classes, music and meditation. Anger and stress management, financial planning, and preparing for job interviews are some of the additional courses offered at this facility. Before you can visit you must have filled out a visitors application, and it must be approved. The visiting times are on Saturdays and Sundays from 9am-3pm. Registration for visitation begins at 8:15am, final registration is at 2pm, if you arrive after 2pm you will not be allowed to visit. You can arrive at the facilities parking lot no earlier than 7:30am.